A Cosy Tranquil Cottage (with Mod Cons). Close to Bayeux and Normandy Beaches. The cottage is a modern conversion of an old farm building. The walls we believe to be over 300 years old, and these have been completely cleaned and repointed to blend comfortably within their ancient setting. The original beams have been similarly totally renovated and are retained in the sitting room, giving the living space a very attractive blend of both modern and antique. Set back from the main road to Bayeux and surrounded by fields and woodland, this holiday property is particularly quiet and restful. The front garden has a recently planted orchard, and the house is surrounded by flower borders. At the back, the lawn is an ideal spot for a quiet drink, or a meal outdoors. The property is close to Bayeux with its beautiful Cathedral and very famous tapestry. Just five minutes away is the market town of Le Molay Littry with its Mining Museum, Mill and Thursday morning open market. Within easy distance are all the D Day anding beaches, many Normandy War museums, the pretty, rose strewn British Cemetery in Bayeux, and the hugely impressive and moving American Cemetery overlooking Omaha Beach at St Laurent. Around the town of Balleroy, which boasts a striking Chateau, there are the extensive forests of "des Biards"with facilities for cycling, bird-watching, sighting wild deer and other wildlife and flora. There are horse riding stables in Le Molay Littry, and near to the golf course at Port en Bessin. From this charming cottage you can easily visit Le Mont St Michel (2 Hours), Suisse Normande (90 minutes) with more horse riding, bungie jumping and canoeing, Villedieu-les-Poeles, (90 minutes) a town where church bells have been produced for centuries, Granville, (1 hour) Deauville, Trouville, and Honfleur, playgrounds of the Victorians, Caen ( 30 minutes) with lovely examples of Norman architecture and a huge open market on Friday, Cherbourg(1 hour). Only about half an hour away is the pretty beach of Arromanche, with its traffic free centre, and many little cafe's and restaurants. This is the site of the Mulberry Harbour, and on top of the hill is a museum with a difference. St. Mere Eglise where John Steele hung from the church tower attached to his parachute, is 45 minutes away, and the John Steele Auberge is an excellent eating house, at reasonable prices. We are a professional couple living in the South of England. Normandy is close enough for us to visit for the weekend, as well as for longer periods. After the noise of London, we really appreciate the space, the peace and the tranquillity of our property. It offers a wonderful opportunity for us to unwind. Andrew has known this area of Normandy since he was quite young. He is a keen horologist, and you will see examples of rescued and restored French clocks in the cottage. We both share a very keen interest in gardening, and are working together to develop our orchard, vegetable patch and flower borders around the cottage and the farm house. We discovered the farmhouse and buildings, around a central gated yard, quite by chance, in the Spring of 2006. We loved it from the moment we saw it, and whilst registering the fact that there was a tremendous amount of work to be done to make it habitable, we felt that it would be a project that both of us would thoroughly enjoy. We have gained tremendous satisfaction as it gradually emerged from a very basic farmhouse, with virtually no modern amenities, into what it is now. It was in August 2012 that we started work on converting the barn adjoining the farmhouse into a cottage to offer additional accommodation for friends and family. We have not finished, as we have further plans for the garden and for the smaller building close to the vegetable patch. Both modern en suite shower rooms are finished to an extremely high specification, and offer the visitor every possible comfort. Also there is an equally luxuriously finished shower room on the ground floor, situated conveniently off the living room. Each bed has a bedcover, duvet and two pillows per person. There is plenty of off-road parking space in the yard behind the house. We have internet in the main house. The walls are so thick between the properties that most people can not pick up a signal indoors, but they can pick it up when sitting in the garden. Towels for use in the cottage are provided, as well as towels for the beach if required. There is a coffee machine and a cafetiere. A starter pack of tea and coffee is supplied. We will supply tea/coffee/milk/orange juice/water so that you can have a drink on arrival. If you will be arriving late in the evening we can arrange other provisions if you let us know in advance. The dining kitchen for 4, is fully equipped and fitted with attractive units. The room is spacious and light. It has a fridge freezer, electric oven and grill, electric induction hob, a dishwasher, kettle, toaster, washing machine and tumbler drier. There is a table in the kitchen breakfast room, as well as the option to use the table in the sitting room. A table and chairs for use outside is also provided. A small selection of books is supplied. Please feel free to add to it with a books you have finished reading. In the sitting room there is a selection of games to suit all ages. This can be provided if requested at the time of booking. The cottage has its own garden area, but you are welcome to use the yard behind the house and the orchard area to the front of the house. Vegetables from the garden available when supplies permit. Omaha golf club has 24 holes, and is well served with a very attractive club house, which serves very good food, at reasonable prices. The view from the dining room is lovely, overlooking the port at Port en Bessin. The club house is open to the public, and there is a very sunny terrace outside. Further afield there is a demanding golf course at Clecy, in Suisse Normande, with steep inclines for the hardy and energetic. It takes about 45-60 minutes to arrive at Clecy. There is also a golf club at Caen and another one at St Lo. Both of these golf courses would take approximately 45 minutes travel by car. All our internal doors are wheelchair accessible, but of course, the bedrooms are upstairs. Outside the terrain is flat, and it is quite possible to drive close to the main door to the property. The downstairs plan makes passage from kitchen into living room very easy, and the downstairs shower room is also easy to move into, should any visitor have a physical disability. Lovely property, home away from home with all the amenities. Wonderful experience with Susan going above and beyond when assistance was needed! I would highly recommend! Stayed for 5 nights in July at Le Petite Coliberderie. Lovely, atmospheric farmhouse, very well equipped with washing machine, dishwasher and plenty of crockery and cutlery. Three bathrooms meant no-one was queuing to use the loo!! The cottage is spacious and was ideal for our family stay (2 adults and 2 children) and also had a nice enclosed and secluded garden as well. The road was not too busy so not too much traffic noise to spoil the tranquillity. The cottage is also ideally located for exploring the surrounding countryside, being only about 20 minute drive from Bayeux and less than half an hour from many of the D-Day beaches. The nearest town of Le Miolat-Littral is small and quaint and has all the shops you will need. We had some lovely clear nights too and the absence of streetlights means the stars blazed brightly overhead - sitting in the garden gazing up at the heavens is certainly relaxing! Highly recommended if you are looking for a base to explore the Calvados region of Normandy or are just looking for a nice peaceful get-away. Thank you for your feedback, and thank you for leaving everything in such good order. I am sorry that we did not get to meet you, but delighted that you enjoyed your stay. If you ever visit this region again you will be very welcome (we offer a small discount to returning visitors). We fully agree with you about le Molay Littry - we rarely do any shopping anywhere else. Excellent, lovely property with a superb host. Property was ideal for two couples, everything we needed was there. It was centrally situated for our visits to the D-day sites. Susan was an excellent host giving any help and information when requested. Will certainly stay again when in the area. The cottage is a comfortable and ideally situated property, offering a large, well equipped kitchen and spacious bedrooms and bathrooms. Hosts Susan and Andrew were very welcoming and provided excellent advice as to local shopping and sight seeing. 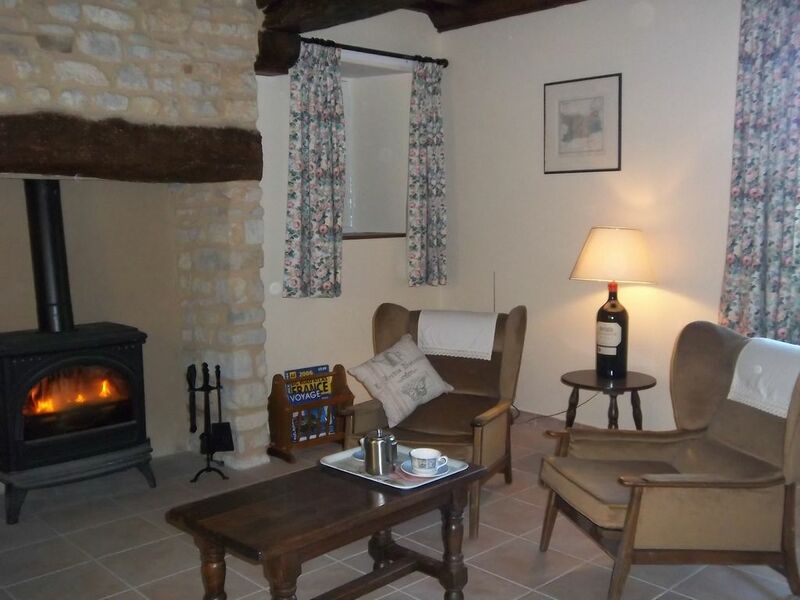 The cottage is located in the country but an easy drive to both major cities and Normandy tourist areas making it ideal for full days of seeing the numerous historical sites and then quiet evenings relaxing. Cottage was clean and well laid out. Kitchen was really good and very well equipped. Area was perfect for our trips to the D Day landing beaches and cemeteries. All in all, Tres Bon. I am delighted that you all had a good holiday, and that you had an opportunity to sample some of what Normandy has to offer. This cottage is in a perfect location for seeing the sights of Normandy and for making day trips to the D-Day beaches, Mt. Saint Michele, Bayeux, etc. The cottage is newly renovated, immaculate, comfortable, and has a well-equipped kitchen for those nights of cooking in. The bathrooms are beautifully tiled with towels like new, and the bedrooms were very quiet and comfortable. Susan, the owner, was so easy to deal with throughout the booking process with her quick responses to emails and information. She was at the cottage to greet us upon our arrival with a warm welcome and showed us around the house. We really appreciated her outstanding restaurant recommendations and overall helpfulness during our stay. Our only regret was that we weren't there long enough to enjoy the beautiful setting of Susan's and Andrew's farm. We would highly recommend the cottage to others traveling in Normandy. Thank you, Susan and Andrew. Thank you for your feedback - we are glad that you enjoyed your stay. You did a lot in a few days but there is so much to do in Normandy that you must come for longer next time. Omaha Beach is about 30-40 minutes away, and above it the American cemetery, which is a very moving and poignant place to visit, as well as being superbly presented. Slightly closer is Arromanche, site of the Mulberry harbour, with a pretty little beach, and a very interesting museum up on the headland. Parking here in summer is not always easy, so travel early for a visit here. For ferry travellers from the UK, we are within easy access of Cherbourg(1 hour), Caen ( 45 minutes), Le Havre (90 minutes) and Calais ( 4 hours). Those planning to arrive by plane should look for flights to Paris or to Dinard in Brittany. From Paris you are able to hire a car at the airport, or take the train from St Lazare station direct to Caen, or to Bayeux, where car hire is available in both towns. Use of car is essential -although only just outside Le Molay Littry, rather far to walk. Easy day visits include le Mont St Michel (2 hours), Suisse Normande (90 minutes), Villedieu-les-Poeles (90 minutes), Granville (1 hr), St Mere Eglise (45 minutes), Arromanches (30 minutes). Booking Notes: Please contact owner Changeover Day: Please contact owner Each additional night is £50 Notes on prices: Please ask about discounts for longer periods and discounts for returning clients.